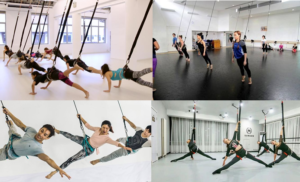 Welcome to Bronte Fitness’s new bungee classes! Bungee classes are a new type of workout that is dominating the fitness industry and we are the first with a studio in Sydney! The classes offer high-intensity workouts that are perfect for toning, improving flexibility and general fitness. These bungee classes are ideal for every fitness level with variations of exercises available for differing difficulties. The workouts are low impact and safe, however, to ensure your safety everyone must attend a ‘bungee basics’ class to learn the fundamentals and safety procedures. Bungee Basics: A class targeted at learning the fundamentals of bungee workouts for beginners. This is mandatory for everyone who wants to do other classes, to ensure you are aware of the safety elements of bungee workouts. This class includes sample exercises from the other classes so that you can figure out which class is best suited for you. Bungee Strength: A class targeted at strengthening, toning and conditioning. This class is inclusive of everyone, with all different fitness levels as it includes variations of exercises for beginners, intermediates and advanced. Bungee HIIT: (High Intensity Interval Training) a class designed to get your heart rate up. Perfect for improving cardio-fitness and burning fat. This includes short, intense sessions with recovery periods. Bungee Boogie: A synthesis of dance and bungee! The bungee band allows you to try new, exciting moves. The combination of different dance styles and the bungee band is perfect for improving cardio health and toning/strengthening as well as flexibility.